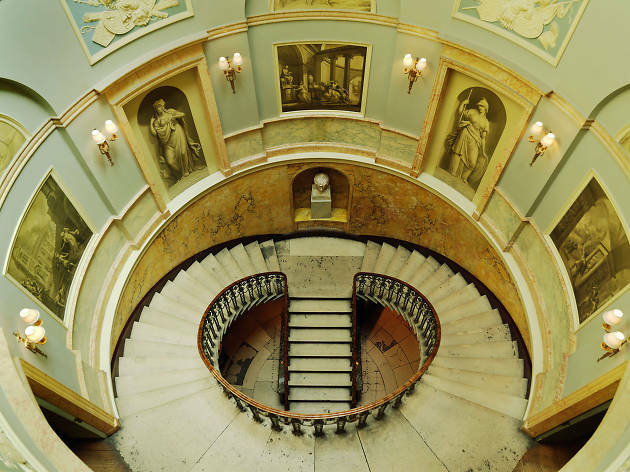 The annual Open House London weekend gives curious Londoners the chance to venture behind the closed doors of some of the capital’s biggest, most renowned and most secretive addresses for free. Discover hidden histories, find interior inspiration or marvel at the new architectural structures shooting up in the capital. Find our pick of the best buildings to visit at Open House September 2018. A gigantic festival dedicated to making architecture accessible to all. Now in its twenty-sixth year, Open House allows access to private homes, government buildings, historic sites and sparkling new skyscrapers that are normally closed to the public and just waiting to be explored. It’s the largest event of its kind in the world and features walks, talks and tours as well as the chance to nose around some incredible spaces you’d never usually get to enter. 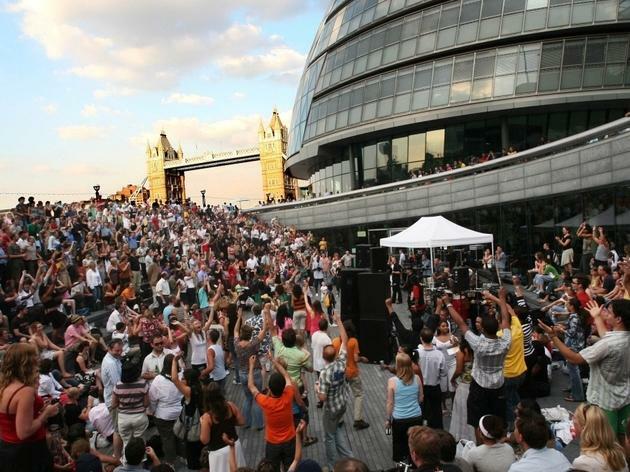 When is Open House London? It takes place over just one weekend every year. In 2018 it falls on September 22 and 23. Where is Open House London? 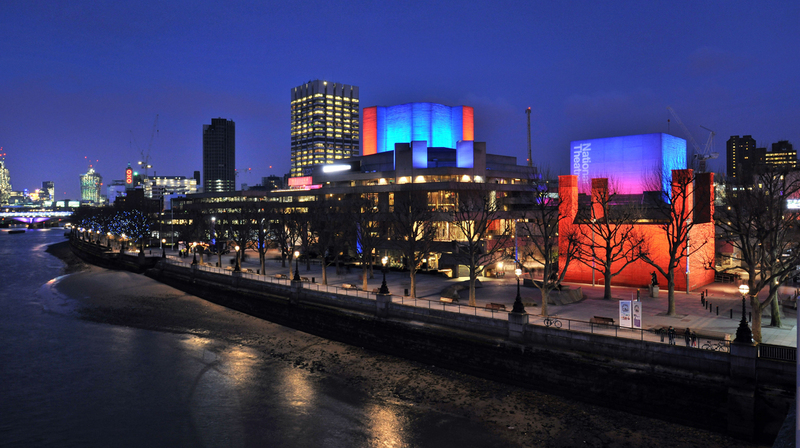 More than 800 buildings across 30 London boroughs will be taking part. It’s a vast sprawl, so you’ll need to dedicate some time to planning your weekend. How much does Open House London cost? Brilliantly, it’s all free. 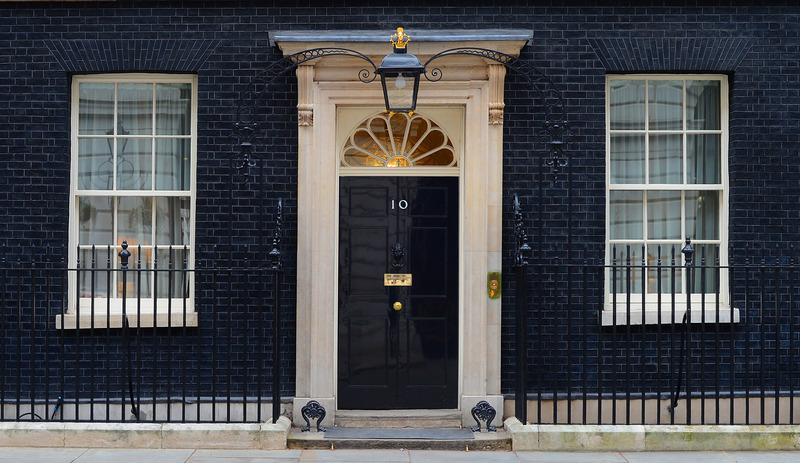 Some of the popular events need to be pre-booked, and entry to venues like the BT Tower and Number 10 Downing Street are allocated via a ballot. With the rest you can just turn up on the day – but be ready to queue. 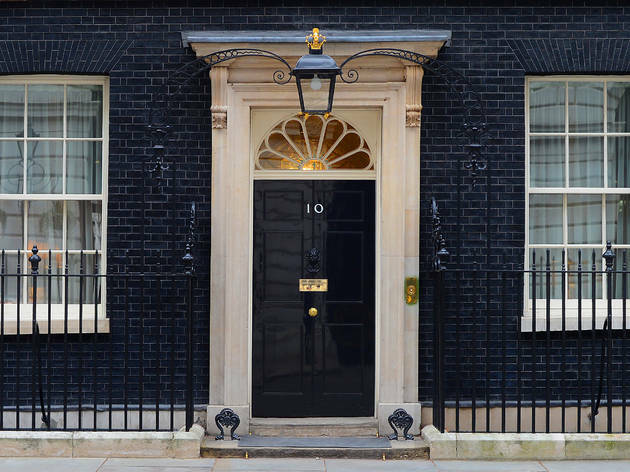 Get a once in a lifetime chance to step behind Britain’s most iconic front door, thanks to these tours by Open House London. Surprise: Number 10 is actually made up of two houses joined together, a basic terraced house at the front and a much grander building, overlooking Horse Guards Parade, at the back. Theresa May won’t be in – but you might see Larry prowling around the place, which is much more exciting, no? 10 Downing St, SW1A 2AA. An extravagant building fit for royalty. 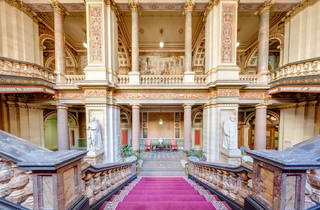 This private palace, originally built for the Duke of York, has a magnificent central hall and staircase. You can access the whole house including fine rooms on ground and first floor. 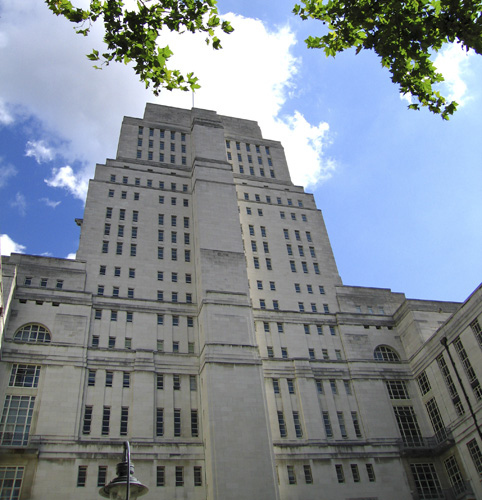 This Grade II-listed building – actually London’s tallest secular building when it opened in 1936 as the administrative HQ of the University of London – balances Portland-stone classicism and art deco elements in perfect harmony. Look out for the handsome, lavishly panelled interiors and original period features – stars of Richard Loncraine’s compelling 1995 adaptation of ‘Richard III’. Sir Christopher Wren’s magnificent place of worship is open all year round to visit, but during Open House, otherwise off-limits areas are open, including an eighteenth-century library packed with leather-bound liturgical texts. You’ll also be to pore over Wren’s first model designs for the cathedral and play spot-the-difference between the plans and the building you’re standing in. Wren’s cathedral is the sixth St Paul’s. Previous ones were put paid to by fires and neglect during the reign of Henry VIII. Go marvel. St Paul’s Cathedral, St Paul’s Churchyard, EC4M 8AD. Take a mini tour of Denys Lasdun’s multilayered concrete landscape, a building that has divided public opinion since 1976. 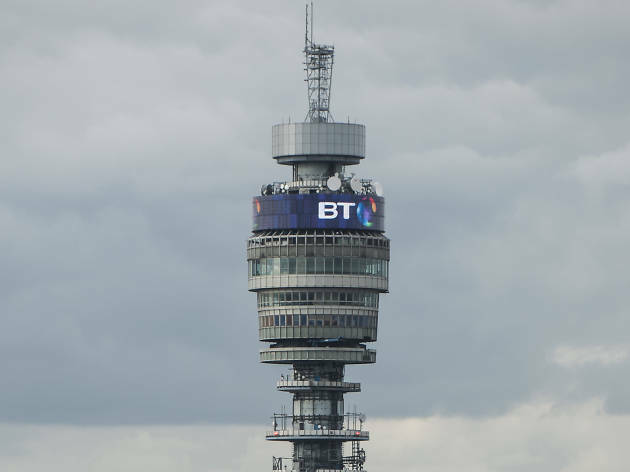 This telecommunications tower shot up in the centre of London in 1965, and was the first purpose-built structure to transmit high-frequency radio waves across the country. 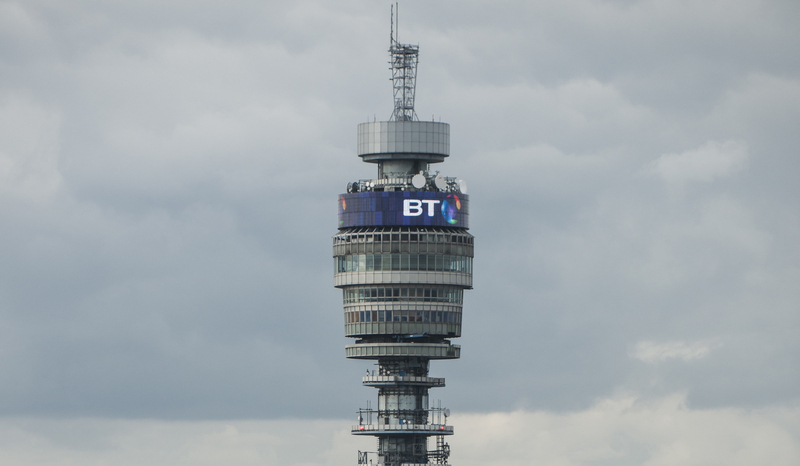 BT Tower is now only open for visits on special occasions including during Open House and you’ll need to get lucky in the public ballot to bag a ticket. If you do, you’ll find yourself whizzing up to the thirty-fourth floor which used to house the famous rotating restaurant and which offers unbelievably good views across the entire city. Don’t worry, it still spins. 45 Maple St, W1T 4BG. 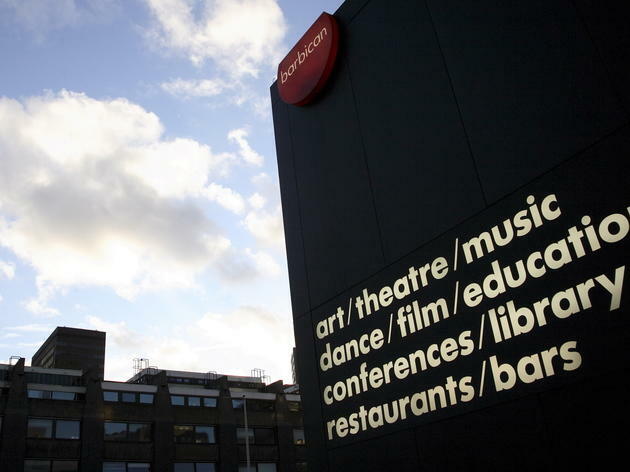 Always end up lost on the wrong floor of the Barbican? 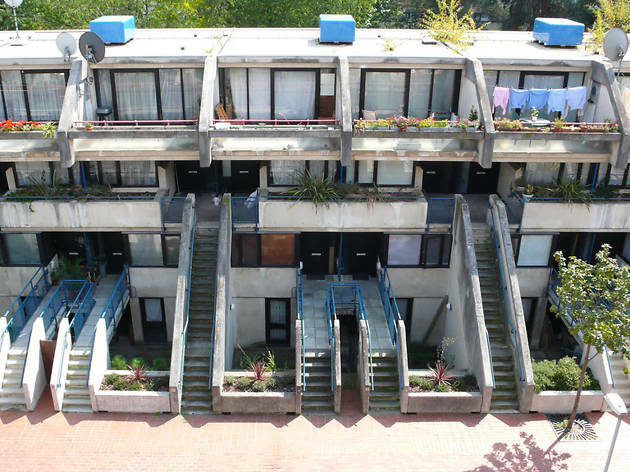 Don’t miss a guided tour of Chamberlin, Powell and Bon’s 1960s fortress of London culture. 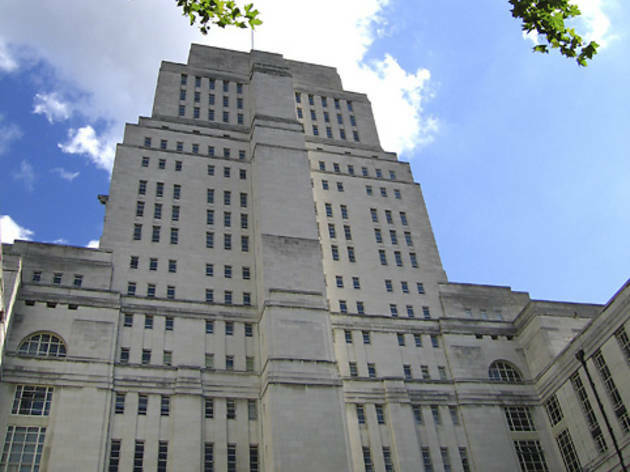 Many of the buildings on the Open House books have stood proud in London for quite some time, but with the capital’s skyline in constant shift, the programme is keen to showcase some of the newbies rising up too. 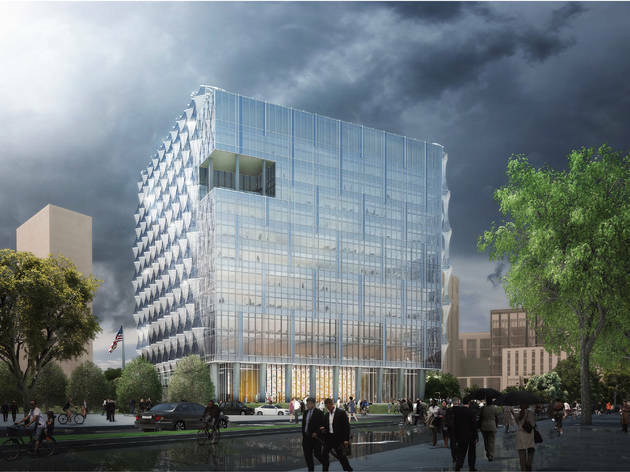 The new US Embassy in Nine Elms is one of the fresh structures to enter the capital mix, boasting energy-efficient building techniques and transparent design intended to mirror the values of freedom and democracy. 33 Nine Elms Lane, SW11 7US. For the very first time, the London Coliseum – the largest theatre in the West End with 2,359 seats, don’t you know – will be part of the Open House line-up, giving you the opportunity to admire some of its original Edwardian ‘Free Baroque’ architectural features and get a historical tour. Its domed auditorium and the South Entrance mosaic are worth craning your neck for. No creeping behind that cascading purple curtain – you’re not the Phantom of the Opera. Take a backstage tour of the Bush – a major theatre in the tiny home of the old Shepherd’s Bush Library. 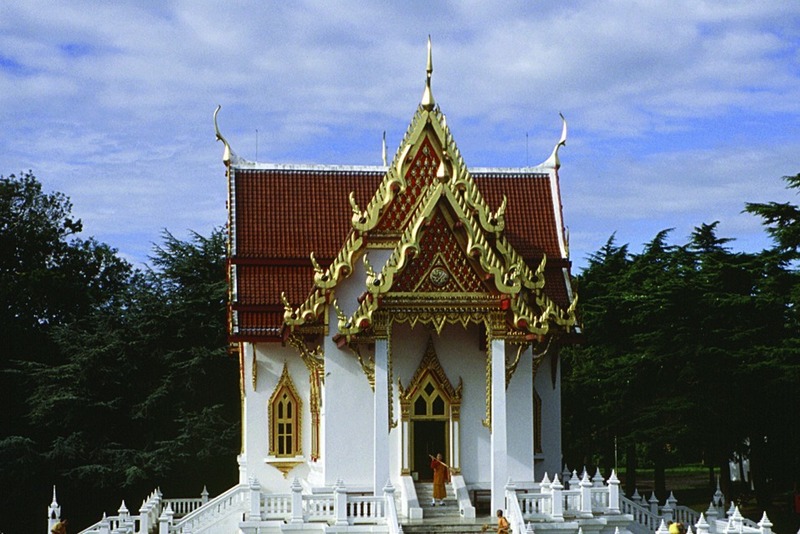 Visit this Thai-style Theravada temple – one of just two outside Asia – to see its amazing Shrine Room. 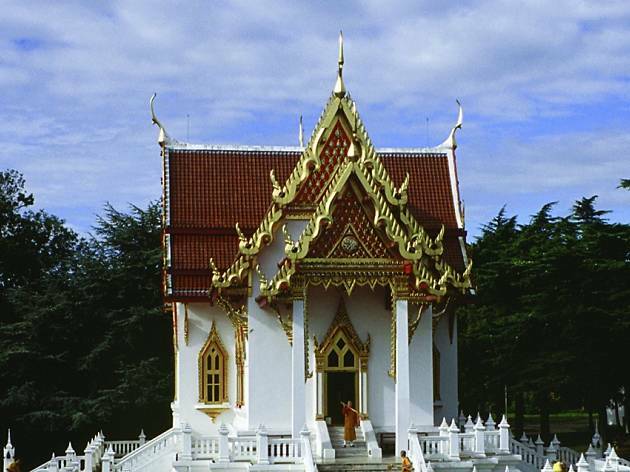 It contains a golden Buddha, copied from the Buddha Sihing in Bangkok, plus there are gardens covering four acres, a lake, grove and orchard. 14 Calonne Rd, SW19 5HJ. 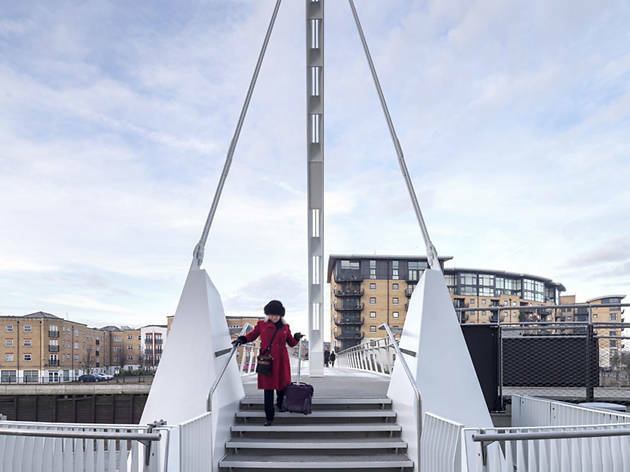 Check out this elegant bridge spanning Deptford Creek that swings open to let boats enter and exit the Thames. It won Best Pedestrian Bridge at 2015’s Structural Awards. Best foot forward, now. Built as a church for the Royal Artillery at Woolwich, this site was bombed in 1944. The RA added mosaics as part of its Victoria Cross memorial and last year the Heritage Lottery Fund gave it a new roof. Grand Depot Rd, SE18 6XJ. 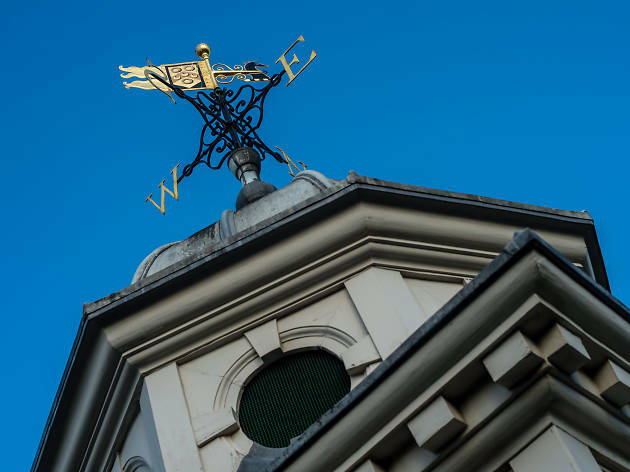 The Grade I-listed north wing of this central London hospital houses spectacular canvases by William Hogarth and a historic Great Hall. A new addition, Maggie’s Centre, a cancer care unit, is crisp and modern in contrast. The church of St Bartholomew the Less is also open to visitors. St Bartholomew’s Hospital, EC1A 7BE. Where once sat a disused car park, now sits Blue House Yard and its colourful collection of standalone worksheds. 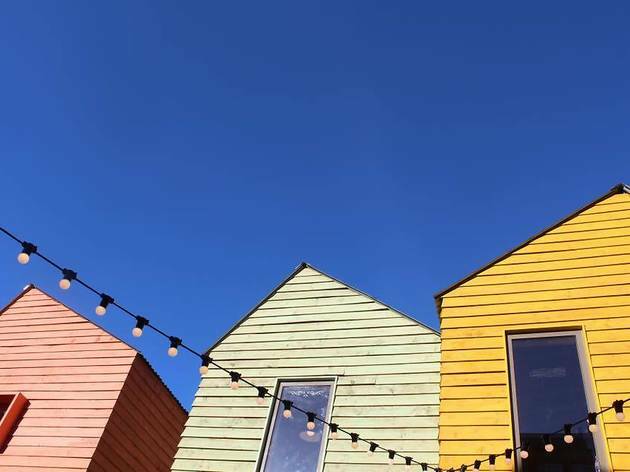 The two-storey timber structures reminiscent of Hastings fishermen’s huts don’t house nets, but creative businesses waiting to catch their next big projects. Delivered by Jan Kattein Architects and Meanwhile Space CIC, the project has popped up to address the lack of suitable workspaces without whopping prices tags in London. 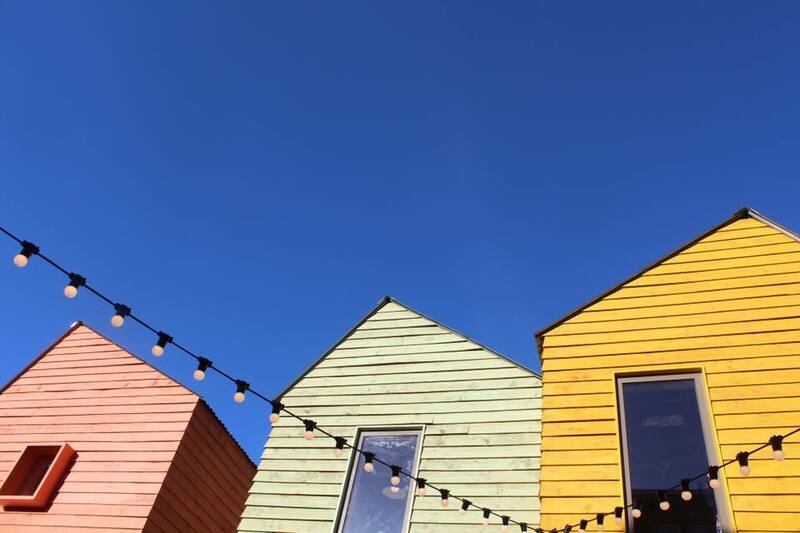 Alongside the self-builds (constructed with help from local community and carpentry students), you’ll find a double-decker bus café, a new public area and pitch space for occasional markets. 5 River Park Rd, N22 7TB. 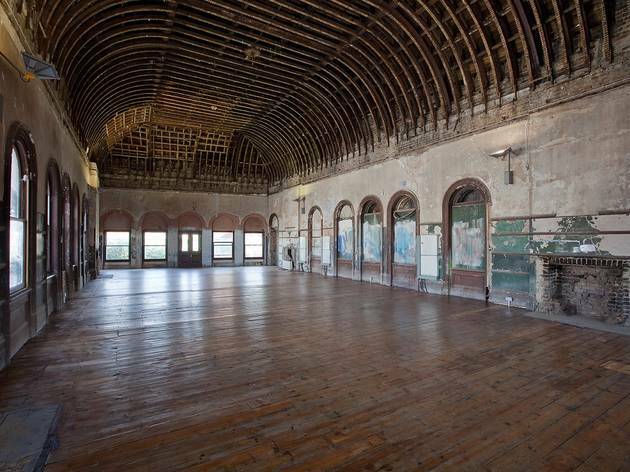 Ever heard of the secret waiting room on the second floor of Peckham Rye station? 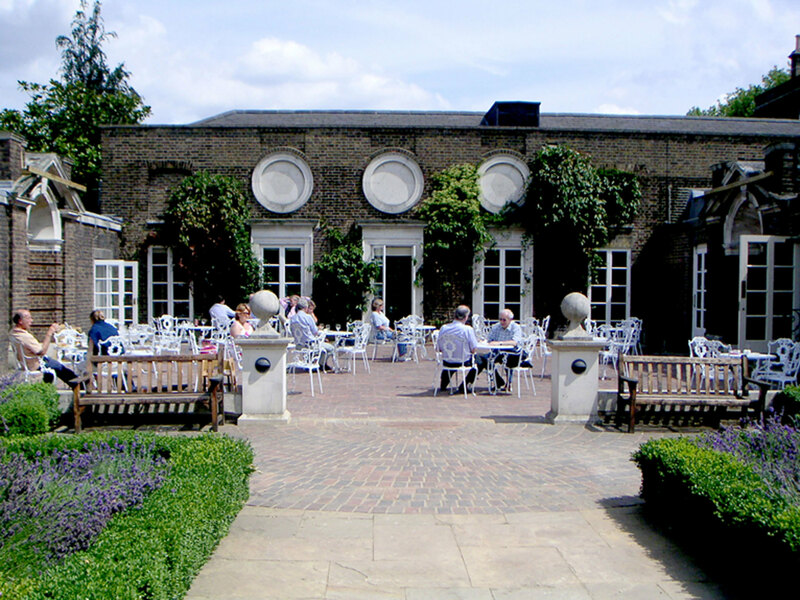 Unless you’re local, the answer is likely to be ‘no’ – the place was bricked up in 1961. Forty five years after closing its doors, it was given a Grade II listing in 2007 and restored by local architect Benedict O’Looney. See it on a scheduled tour this weekend, where you can also check out a photography exhibition charting the history of Peckham. 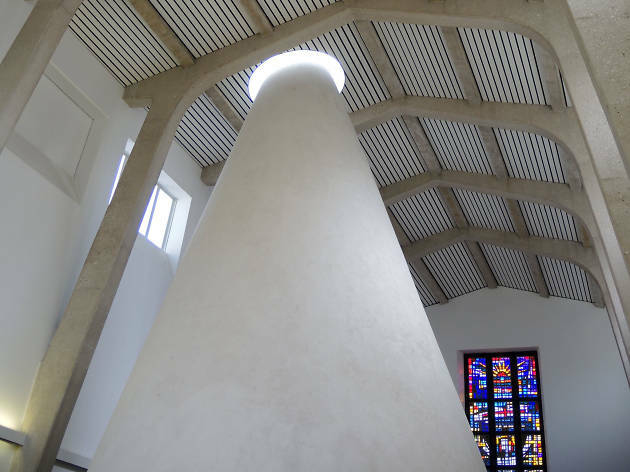 This remodelled shell of a 1960s church building includes the crypt of an 1820s church hit by a V2 missile in 1945, a café, two dramatic eight-metre-high windows and a distinctive conical reflective space. 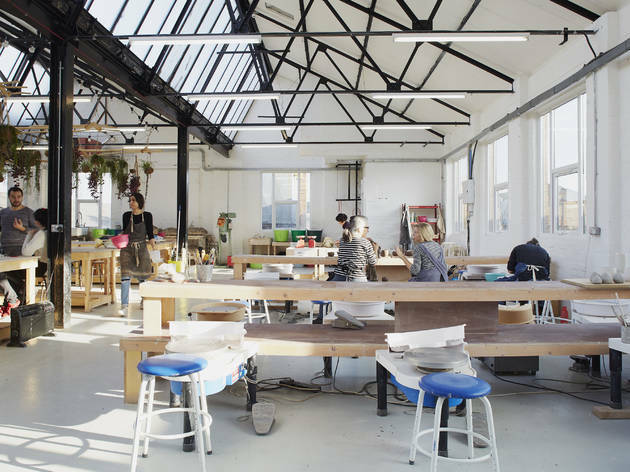 Turning Earth’s second and largest studio sits within the Argall Avenue industrial estate bordering the Lee Valley and is a real hive of creativity. 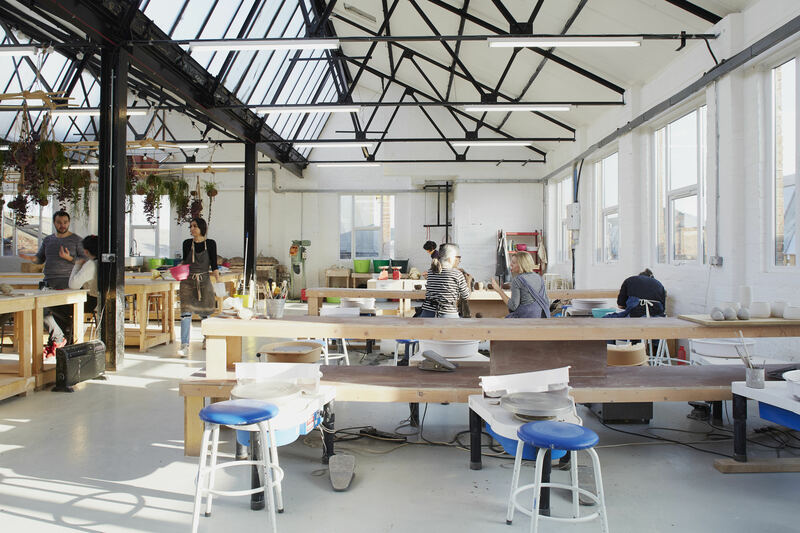 Spend an afternoon nosing around the serene space watching budding potters craft their wares and sign up to become a member if you catch the ceramics bug. On your way out, pop into Lighthaus Café for a slice of ridiculously good banana bread. Top floor, 11 Argall Avenue, E10 7QE. 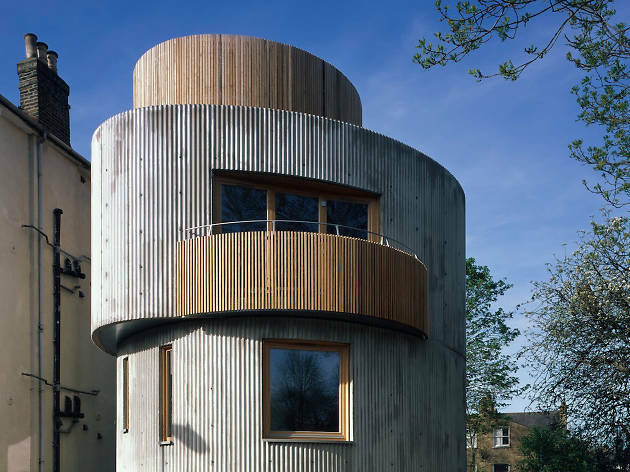 This curvy concrete house on Maury Road is the product of a collab between architects Chance de Silva and experimental musician Scanner. It’s named after Eric Satie’s marathon 28-hour piano piece. Readers of The Wire will be enraptured. 85 Maury Rd, N16 7BT. Architect Neave Brown’s concrete monolith has become a London landmark. When it was built in 1978, it was one of the most ambitious social housing schemes of its time and the first post-war council housing estate to be Grade II-listed. Take a look around the brutalist structure, draped with pops of greenery. This year’s tours will focus on recent community initiatives to restore and reuse various areas for the benefit of residents and locals. As the name suggests, the main event at this refurbished ground-floor flat is the sunken bath extending into the garden. 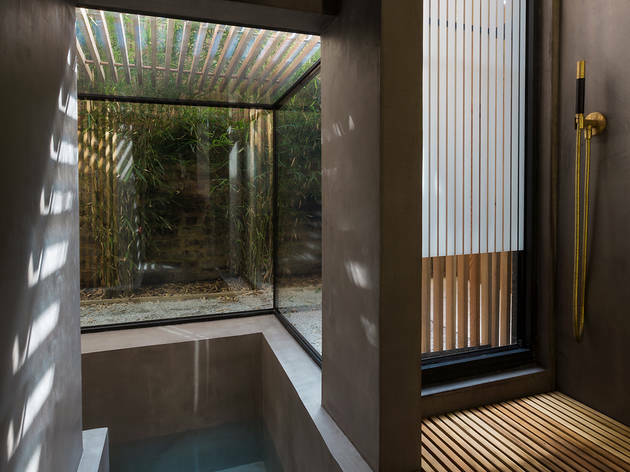 Inspired by Japanese bathing culture and aesthetics, the positioning means the owners can splash about with views of the garden thanks to the glass walls that enclose the tub. The rest of the space is just as slick, with copper kitchen worktops, polished concrete floors, large skylights and bi-folding doors to let in as much natural light as possible. Zen level 100 reached. Ground Floor Flat, 33 Dunlace Rd, E5 0NF. A short stroll up the hill from Honor Oak Park station will get you to this remarkable estate collection of sustainable self-build houses. 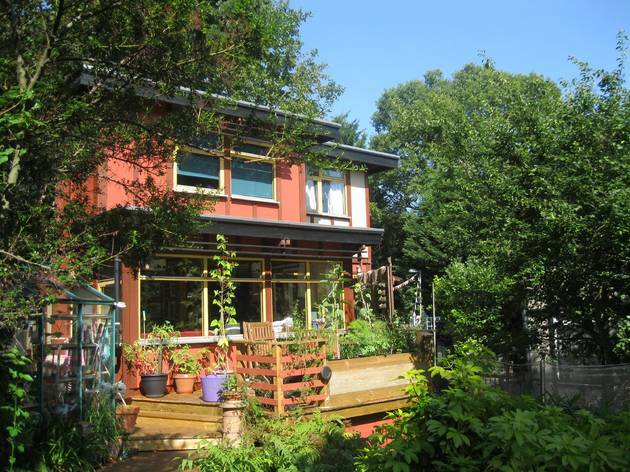 Constructed using methods developed by architect Walter Segal, who led the project in the 1980s, the homes were created by people on Lewisham’s housing waiting list who were willing to help build their own house, with little or no building experience. Some have now been extended and many feature sustainable heating and power. Genuinely visionary. Walters Way, Honor Oak Park, SE23 3LH. Saturday 10am-4pm, owner tours every 45 mins. Pre-book only. Prepared to get whacked with a serious dose of house envy. 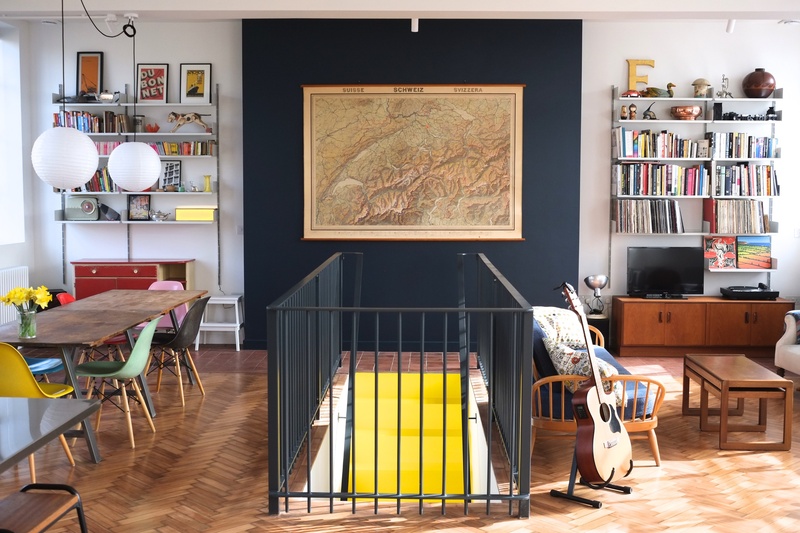 Built as a school science laboratory in 1935, this space has now been transformed into a four-bed family home by Made With Volume’s Carlos Viscoine and his wife Florence. 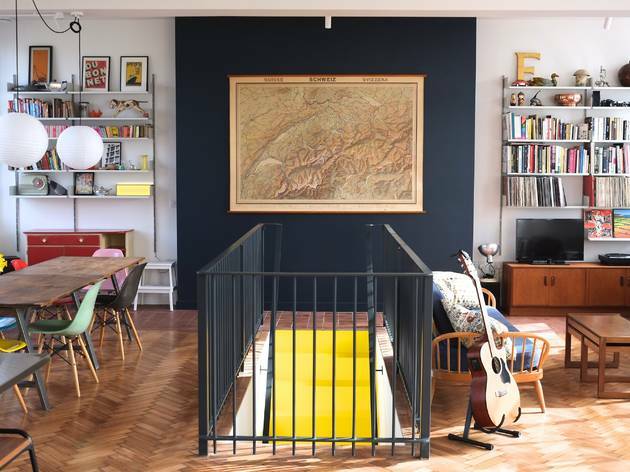 A small set of stairs from the open-plan lounge and kitchen leads to an idyllic rooftop garden, while the zingy yellow staircase in the middle of the space descends to the perfectly designed bedroom area. 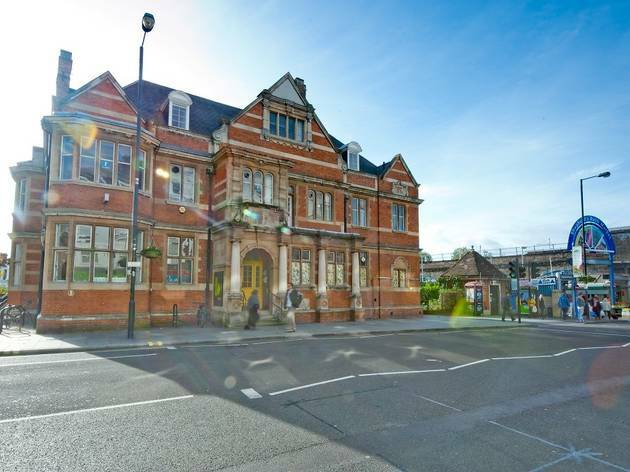 The Science Lab, 134 Trumpington Rd, E7 9EQ. Constructed on land once occupied by Barking Power Station, Barking Riverside is a striking London development that remains ‘in progress’. 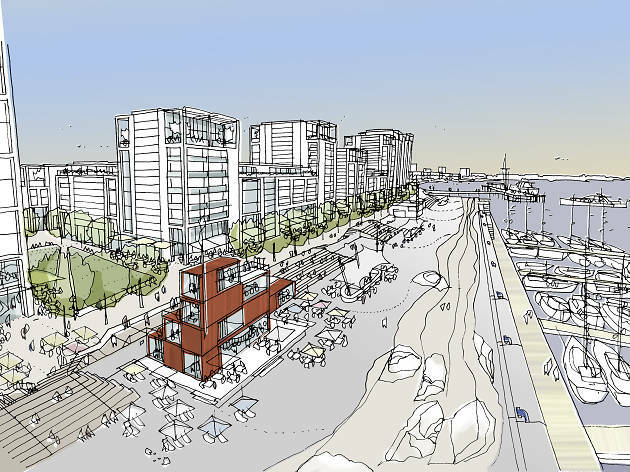 It sits alongside 2km of the Thames, and will (eventually) house up to 29,000 people. Barking Riverside Project Office, Renwick Rd, IG11 0DS. 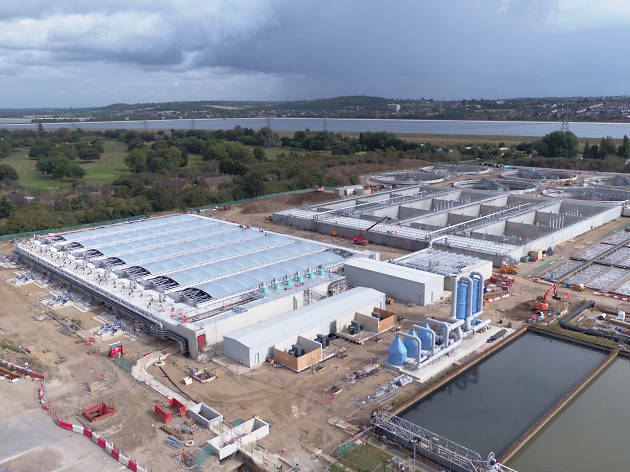 This sewage treatment works processes 209,000 tonnes of flow every day. It is currently undergoing an upgrade, due for completion this year. Pre-booking is essential, as visitor numbers on the live construction site need to be monitored. AMK Site Office, Picketts Lock Lane, N9 0BA. Saturday 10am-4pm. Tours every 30 mins. Ever stared into your recycling bin and thought: What really happens to all this crap? 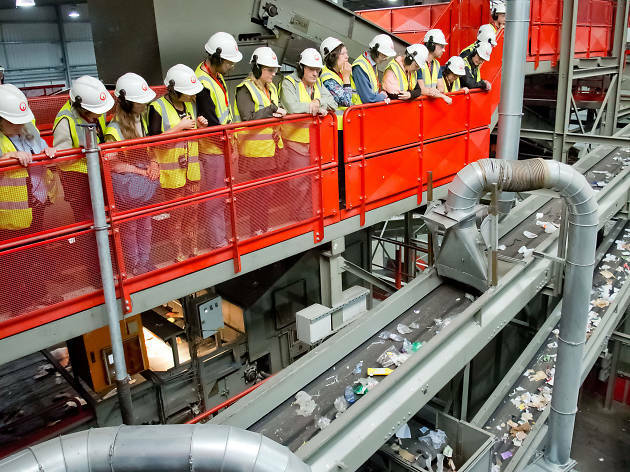 If so, you need to look round this place – it’s Europe’s most advanced recycling facility. All your questions (like ‘What do you guys do with all of London’s old egg boxes?’) will be answered. 43 Devon St, SE15 1AL. 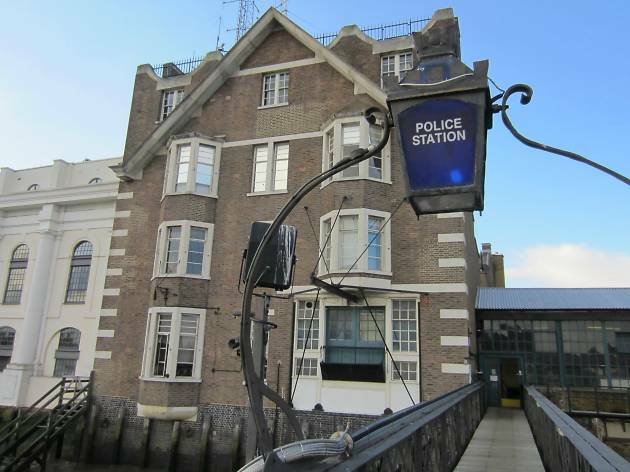 Discover what it’s like to be London’s waterborne version of ‘Magnum PI’ at this little museum for the Thames River Police. 98 Wapping High St, E1W 2NE. 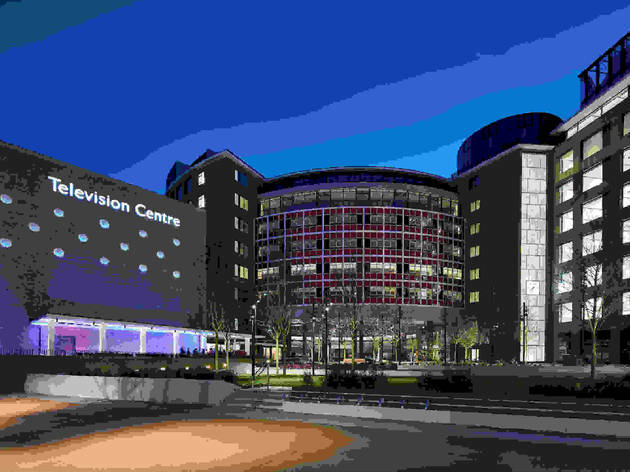 The redevelopment of the BBC’s famous TV hub has introduced homes, offices, public spaces, as well as plush new studios for the BBC to the area. 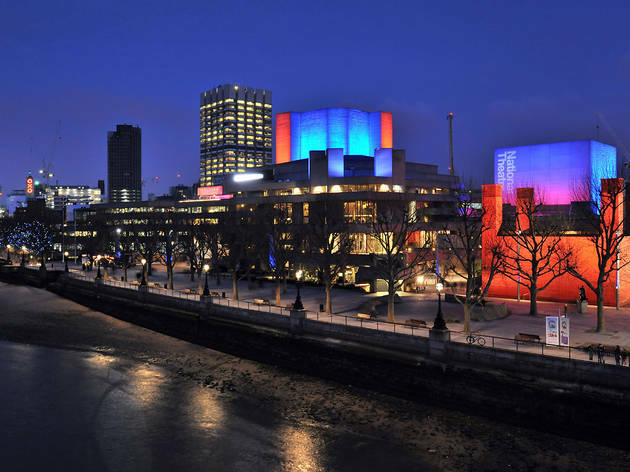 The ongoing project will see the ’50s listed building including the famous Television Centre forecourt, façade and Studio 1 preserved and open to the public for the first time. Join one of the architect-led tours, which take place every 30 mins to discover more about the grand plans. 89 Wood Lane, W12 7FA. Saturday and Sunday 10am-5pm (last entry 4.15pm). 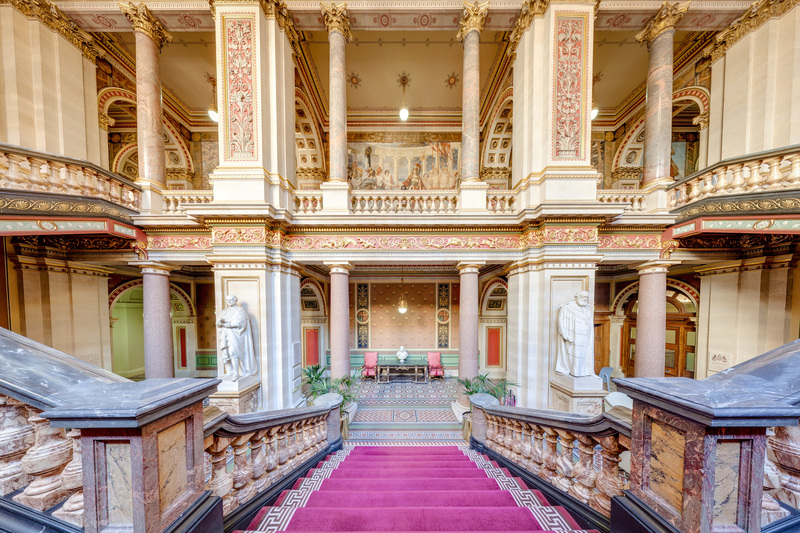 Sumptuously painted walls and ornate fixtures decorate these Victorian government offices. 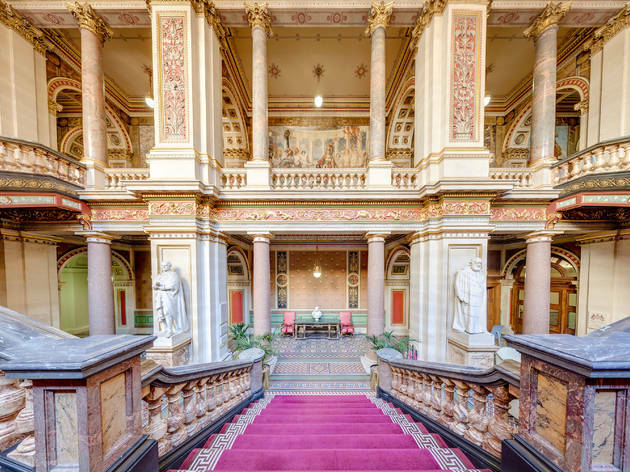 You’ll be able to explore the highly decorative Durbar Court, India Office Council Chamber, Locarno Suite and Foreign Office Grand Staircase, all of which look very much like they did in the nineteenth century. King Charles St, SW1A 2AH. Saturday and Sunday 10am-4pm, hourly tours. Pre-book only. Who knew a house of turds could be so lovely? 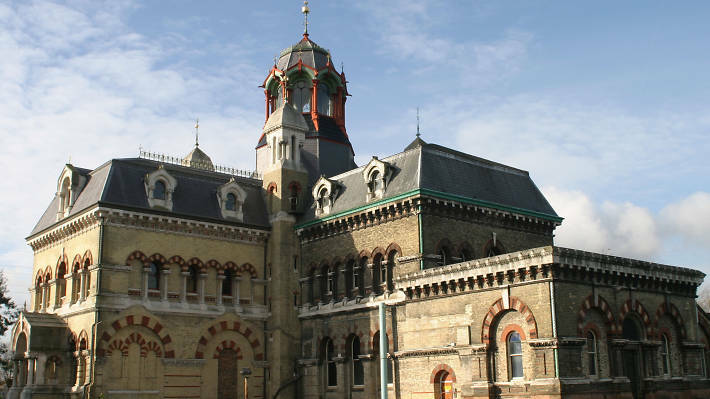 Go and see the gothic architecture and beautiful brickwork of the ‘Cathedral of Sewage’ that saved London from the Great Stink. 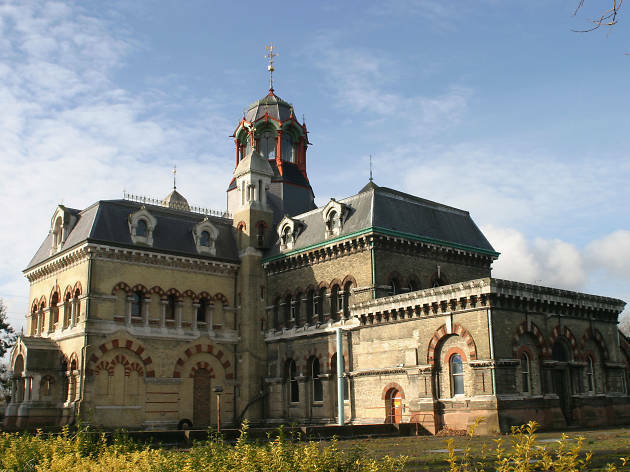 Constructed by Joseph Bazalgette, Edmund Cooper and architect Charles Driver in 1868, the structure helped form the foundation of London’s modern sewage system. Saturday and Sunday 10.30am-4pm. Pre-book only. See what’s behind that rotating triangle outside the brand new home of the Metropolitan Police on the Embankment. 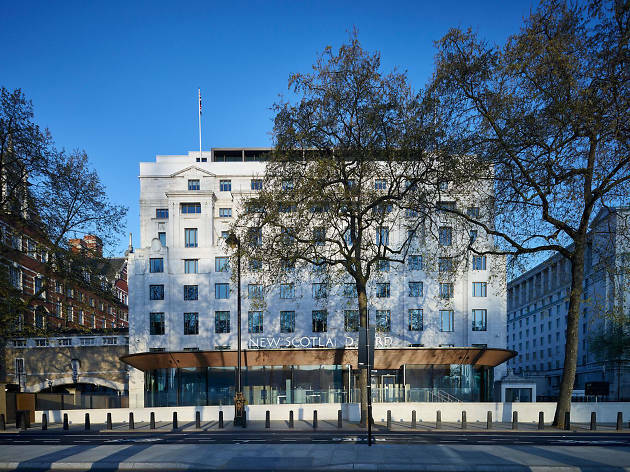 The former Curtis Green building underwent a £58m development to prepare it for its new role as the city’s top cop shop, which included a glazed entrance, restoration of the elegant art deco frontage and colourful loos designed to evoke the designs of London’s squad cars. Sunday 10am-1pm. Hourly tours. Pre-book only. Built for Richard Carew in 1510, Carew Manor is home to the Borough of Sutton’s only Grade I-listed structure: the Great Hall. Once it hosted banquets for the likes of Henry VIII and Anne Boleyn; now it’s where the kids from Carew Academy tuck into their school dinners. Saturday and Sunday 10.30am and noon (max 30 people). 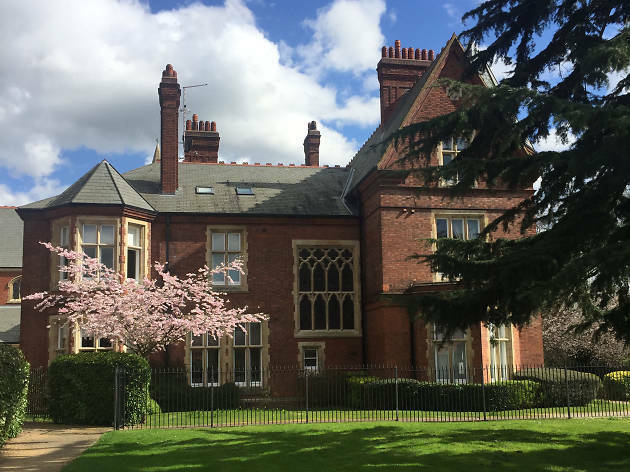 Once a huge nineteenth-century psychiatric hospital, Grade II-listed Repton Park is now home to an exclusive gated community and an impressive health club, which boasts a swimming pool set in the converted chapel beneath the Victorian water tower. Join an hourly tour. Just don’t bring your swimming costume. 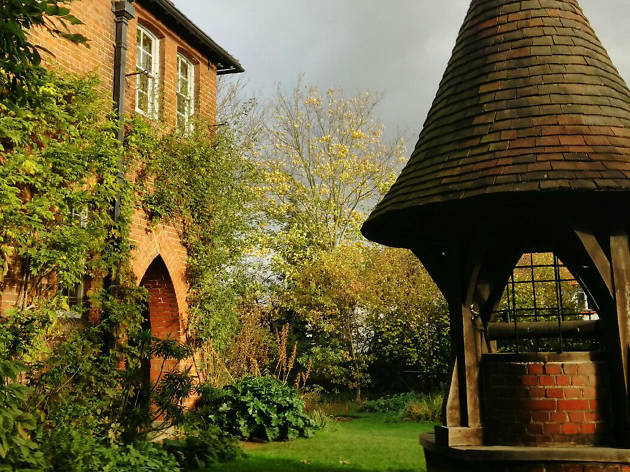 Pre-Raphaelite painter Edward Burne-Jones once called this charming red-brick house the ‘beautifulest place on earth’, and it’s not hard to see why. 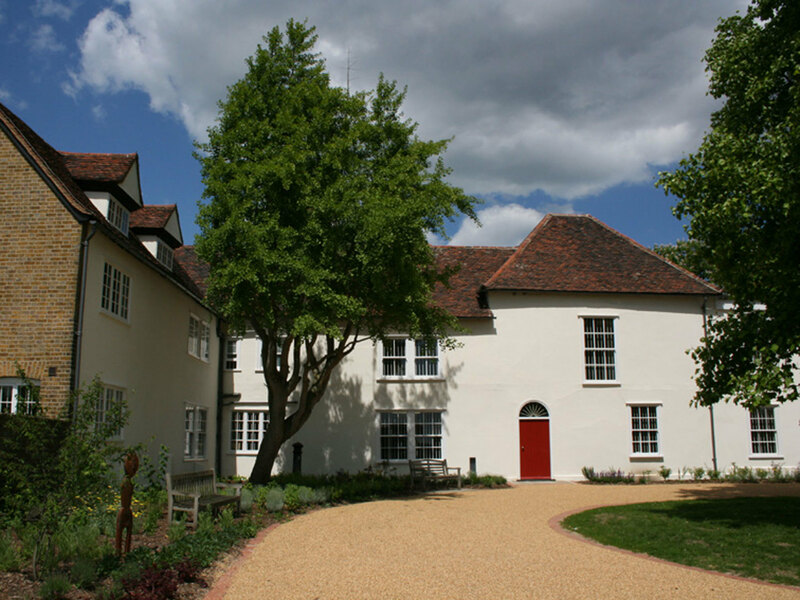 It’s the only house to be commissioned, created and lived in by artist William Morris. It’s ridiculously quaint and a destination for anyone interested in the Arts and Crafts movement. Look out for dazzling wallpaper, a fabulous embroidery of Aphrodite and some gorgeous stained glass. Red House Lane, DA6 8JF. Saturday and Sunday tours 10.30am, noon and 3.30pm (max 15). Pre-book only. 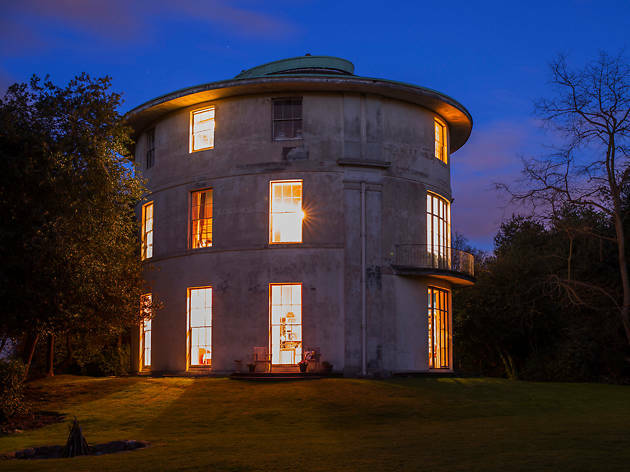 This Grade II-listed, late-Georgian, three-storey stucco villa is said to owe its unusual oval shape to a tea caddy, in reference to its original owner, William Sheldon, who was a successful tea merchant. 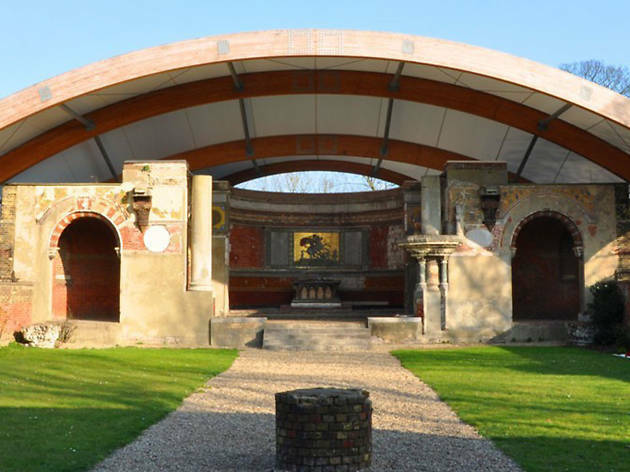 Visit the oldest heritage site in Hillingdon. It’s been occupied since the eleventh century and is still home to the sixteenth-century Manor Farm House, the Grade II-listed, thirteenth-century Great Barn and a smaller sixteenth-century barn, which is now a library. Manor Farm Site, Bury St, HA4 8BD. Take a peek instead this exclusive private members’ club. It was the London base of the Countess of Home and is probably the greatest surviving Georgian townhouse in the capital. 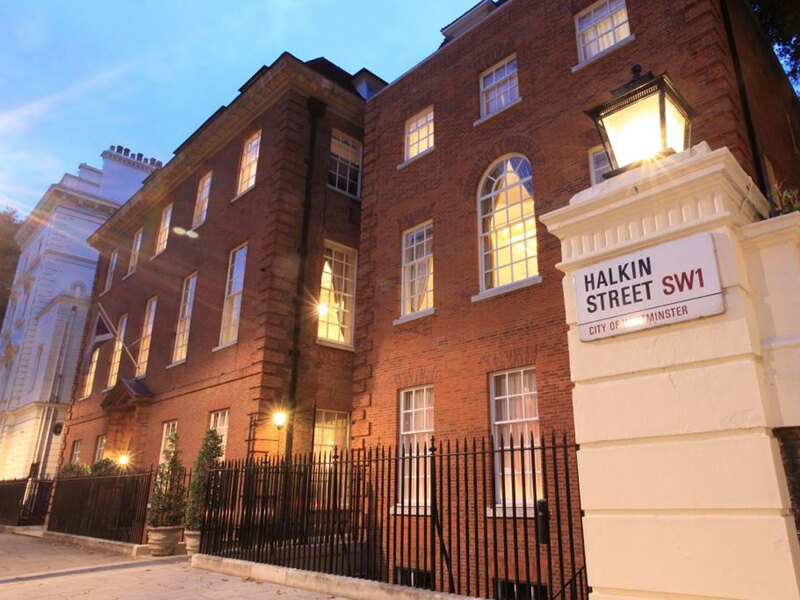 20 Portman Square, W1H 6LW. Saturday and Sunday, 11am-4.30pm (last entry 3.45pm). Pre-book only. Alfred Waterhouse won the right to design this impressive Victorian neoclassical building, which overlooks the Thames, near the Embankment, on behalf of the club. 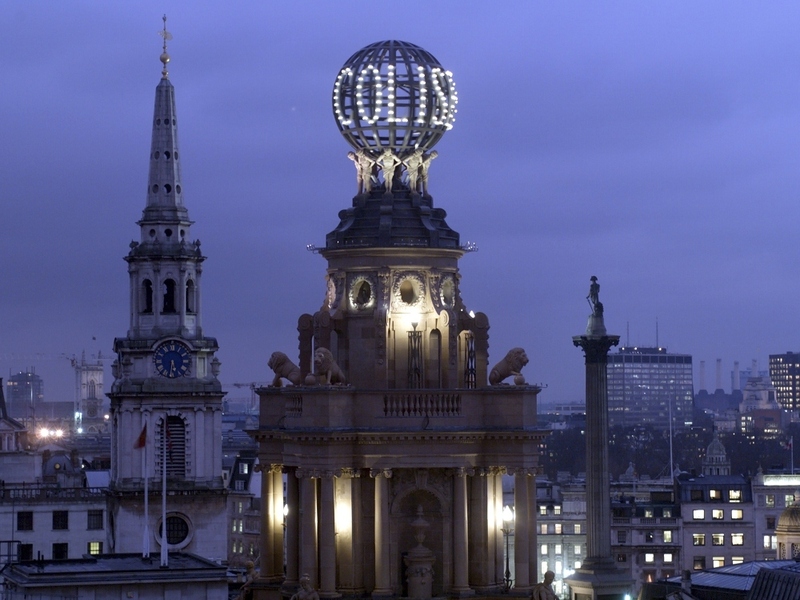 It is the second-largest clubhouse ever built and was the first London building to incorporate a lift and be entirely lit by electricity. It was also one of the first gentlemen’s clubs in London to admit women. 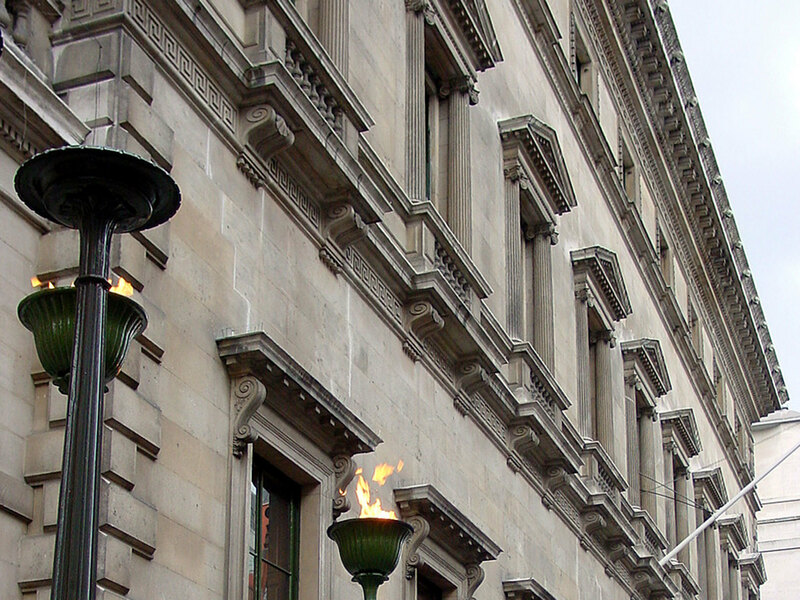 1 Whitehall Place, SW1A 2HE. Saturday 10am-5pm and Sunday 10am-3pm. Pre-book only. 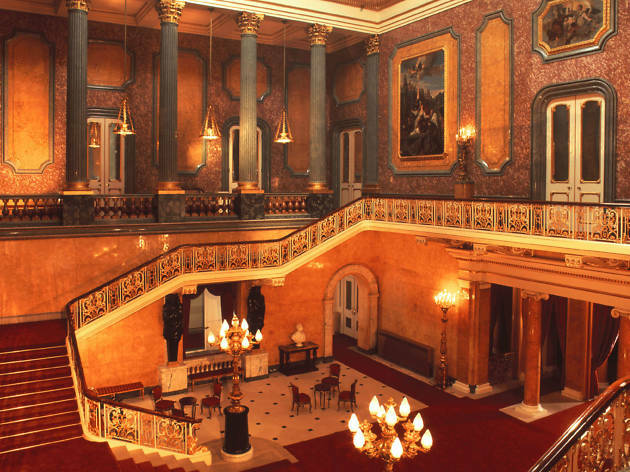 Built as a gentlemen’s club and inspired by Italian Renaissance palaces, the Reform Club is one of the finest Victorian buildings in the country. 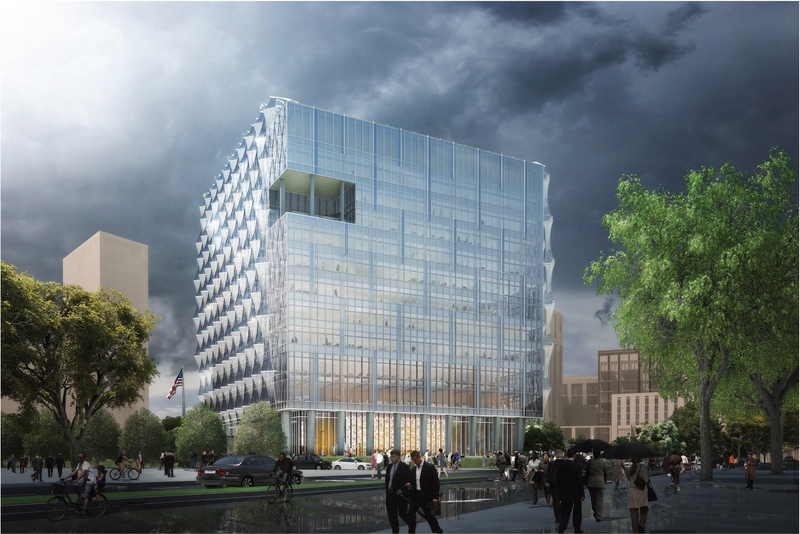 The tunnelled steps bring you to a square atrium with a glass mosaic roof that refracts the light in every direction. 104 Pall Mall, SW1Y 5EW. Sunday 1pm-5pm (last entry 4pm). Pre-book only. This was the last mansion house of its kind to be built in London. The club, founded in 1891, moved to these premises in 1946. A new five-storey wing with a terrace garden was officially (and appropriately) opened on St Andrew’s Day 2006 by Queen Elizabeth. 9 Halkin St, SW1X 7DR. The last of the grand eighteenth-century mansions which once fronted this part of the river, the club retains its quintessentially English traditions and heritage, while providing modern facilities and services for its members with magnificent interiors and extensive grounds. Now you can have a gander without the price tag. 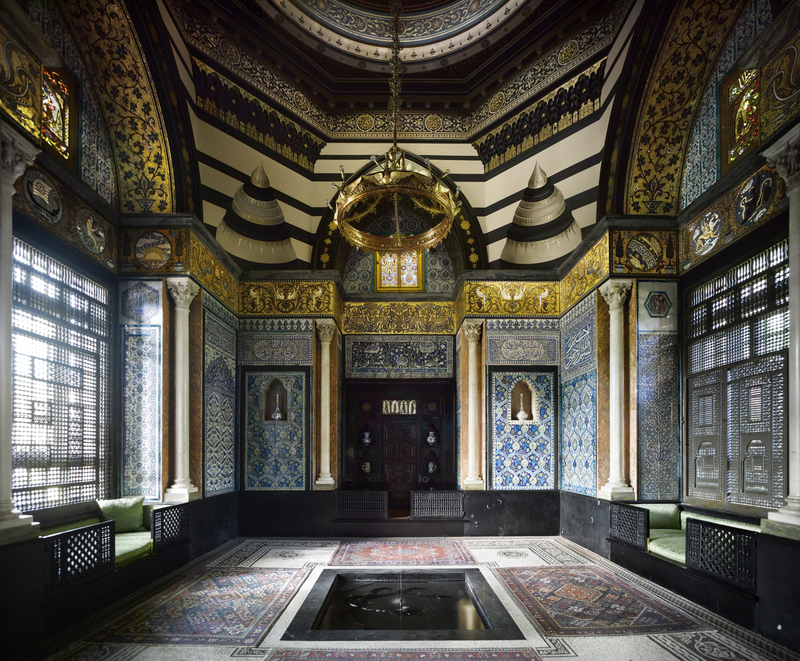 Formerly the home of Victorian artist Frederic, Lord Leighton and designed by his pal George Aitcheson in the 1860s, this west London house is packed with sparkling treasures from across the world as well as works by Leighton himself created in his light and airy first-floor studio. 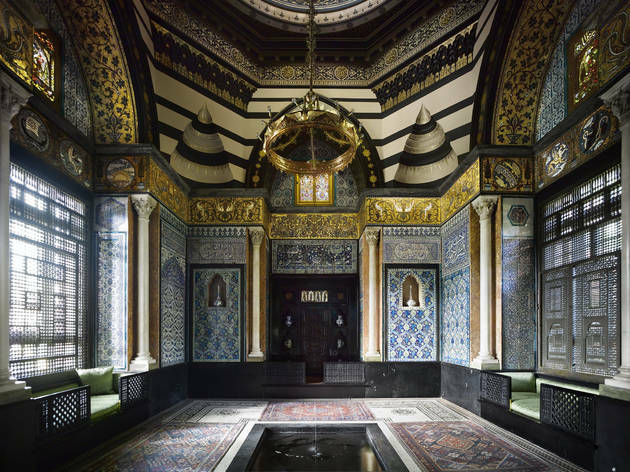 The breathtaking Arab Hall on the ground floor has beautiful decorative tiling and a fountain in the middle of the room. 12 Holland Park Rd, W14 8LZ. The interiors of this Grade II-listed Victorian railway hotel are a riot of twelve types of Italian marble and rich mahogany. 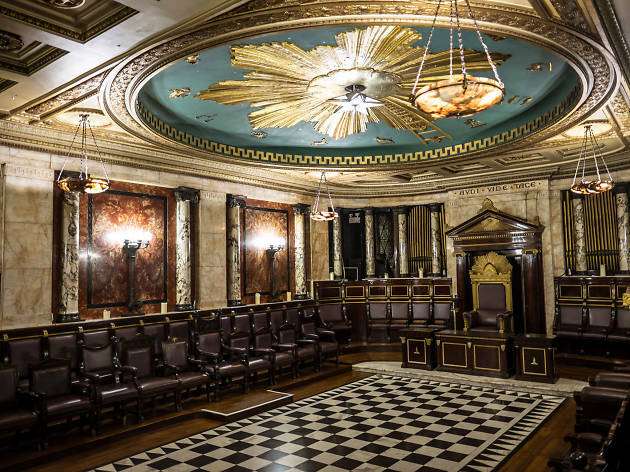 But accessed via a secretive winding stair, it also has a hidden Masonic temple: a dazzling zodiac ceiling looking down on ceremonial thrones. Entrance on Bishopsgate, EC2M 7QN. Saturday 2pm tour. Pre-book only. The Old Palace is a Grade I-listed manor house, the former summer residence of the Archbishops of Canterbury and a place Elizabeth I and other British monarchs are known to have visited. 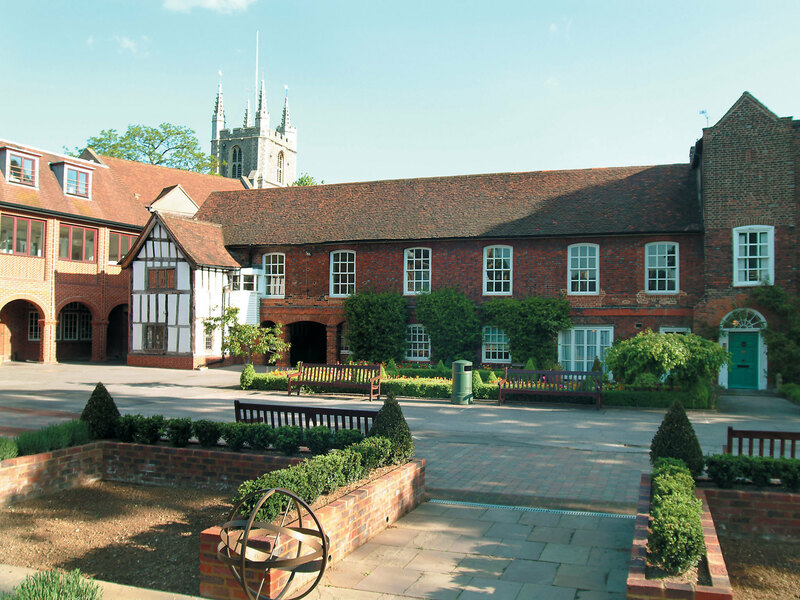 Now the home of an independent girls’ school, it still contains one of London’s finest great halls and its original roof dates from the 1440s. Old Palace Rd, CR0 1AX. Sunday 10.45am-5pm with hourly tours. Tours pre-book only. 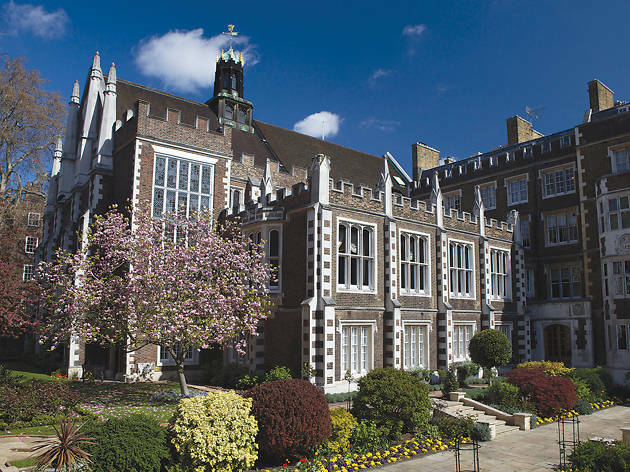 The Charterhouse was founded as a Carthusian monastery in 1371 and later became a Tudor mansion – Elizabeth I and James I both spent time here. In 1611 it was endowed as a school (since moved to Godalming) and almshouses, which it remains to this day. 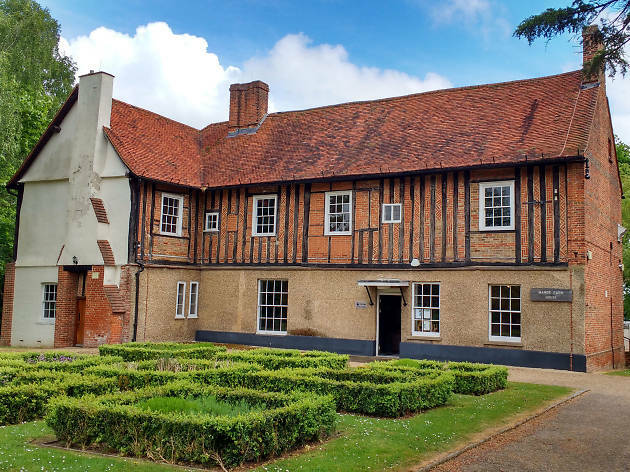 This Grade II-listed fifteenth-century manor house with a medieval moat and recently discovered late sixteenth-century wall painting is the only surviving building of its kind in Dagenham. 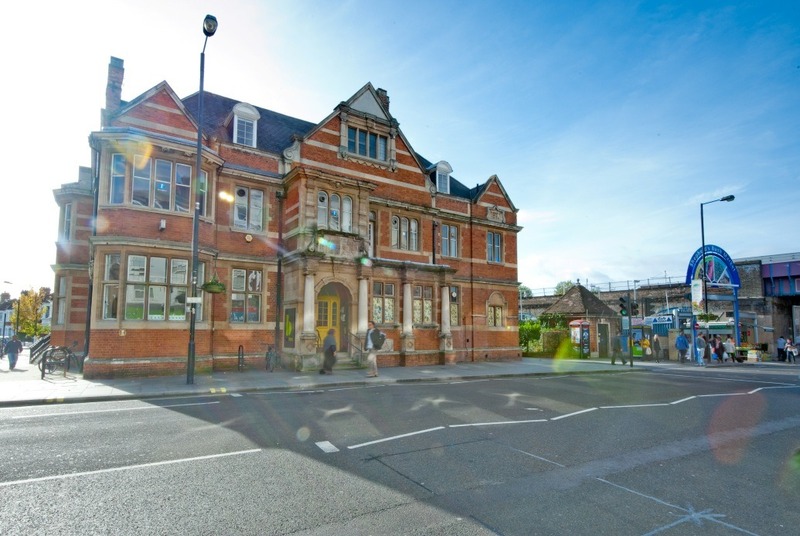 It hosts an exhibition about Barking and Dagenham’s history. 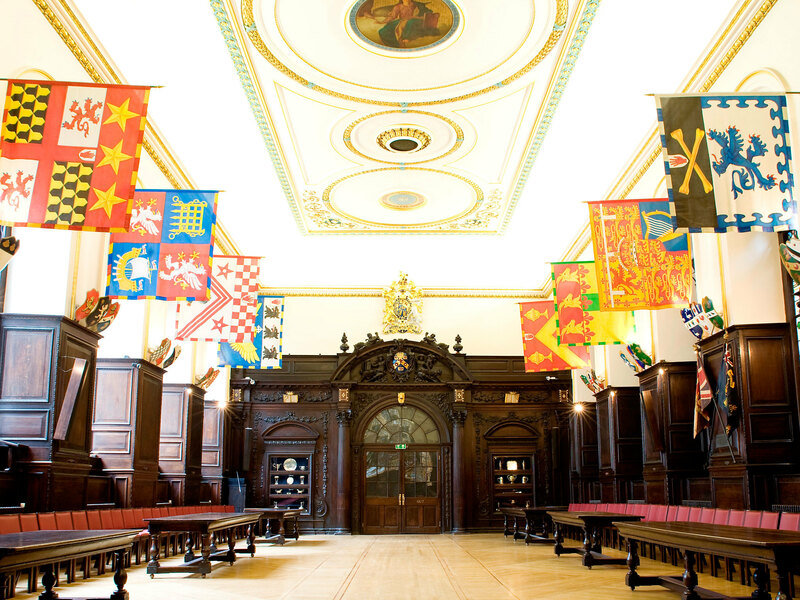 In the heart of London’s legal quarter, Middle Temple Hall is one of the four ancient Inns of Court. 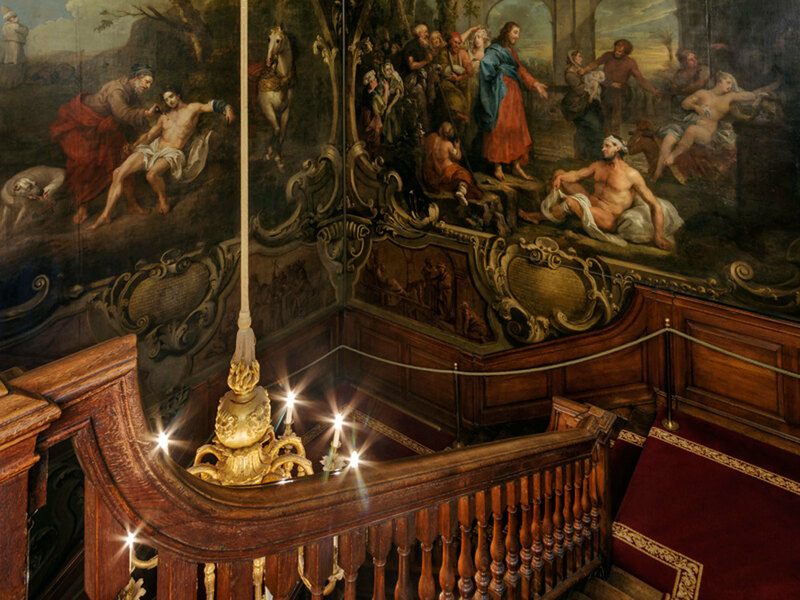 It’s also London’s finest surviving Elizabethan hall, remaining virtually unchanged and highly atmospheric. Middle Temple Lane, EC4Y 9BT. 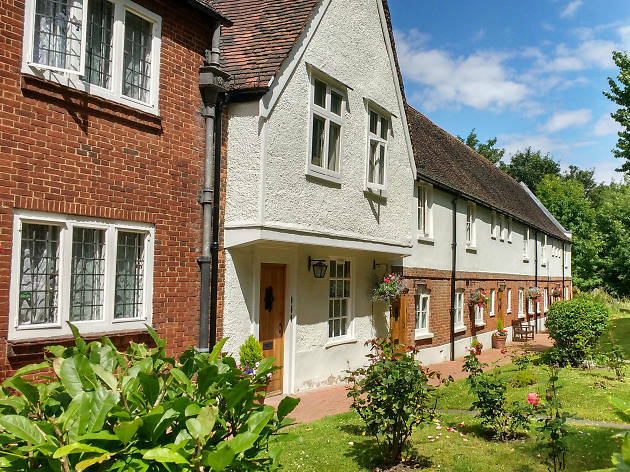 This Grade II-listed, sixteenth-century row in Walthamstow consists of 13 dwellings and offices, plus a hall now used as a committee room. 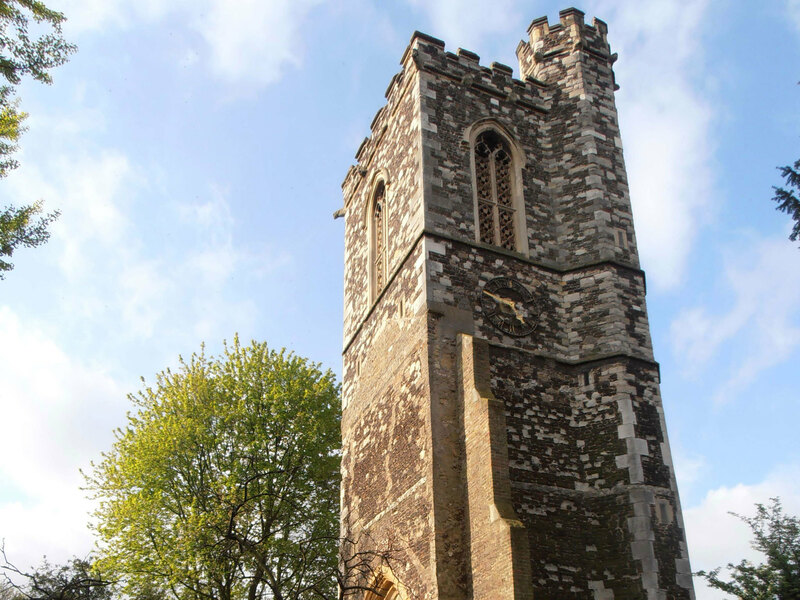 A Grade II-listed tower and chapel is all that remains of this medieval parish church. The tour includes the crypt, ringing chamber and main roof, which has excellent and views in all directions. High St, Hornsey, N8 7NT. Saturday and Sunday 10am-5pm. Pre-book only. 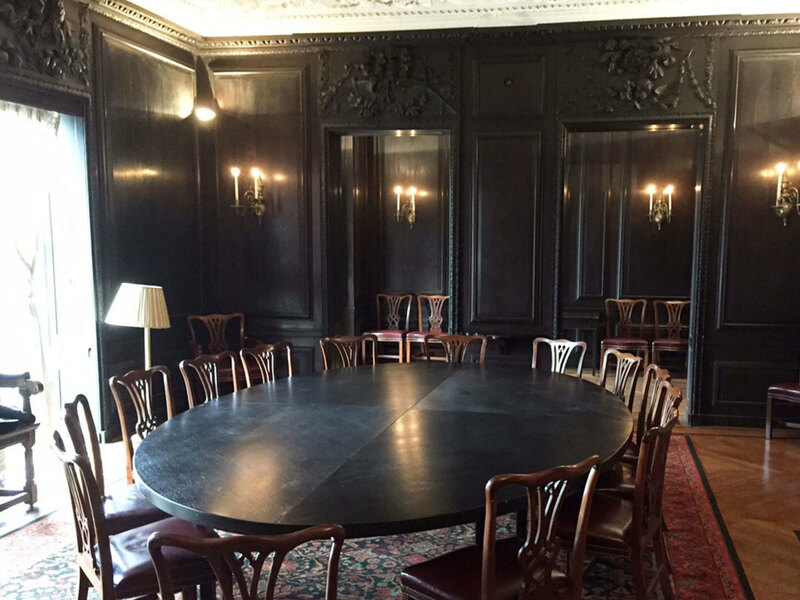 Formerly the boardroom of a seventeenth-century water house, the Oak Room is a fine late-Renaissance room demonstrating the New River Company’s wealth. 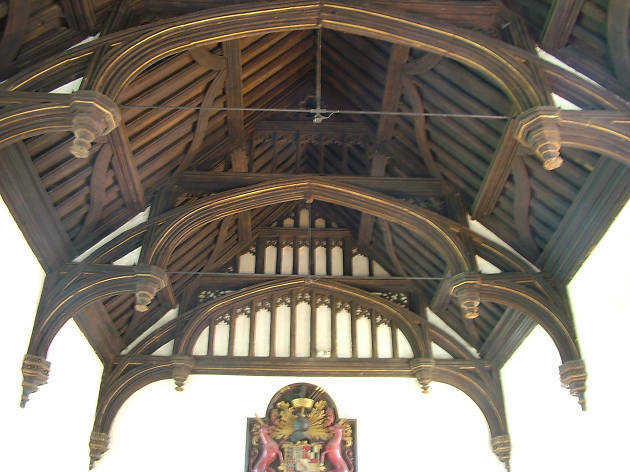 It has a hand-carved oak interior, plus an overmantel and panels over the doors. It’s all grand stuff. 173 Rosebery Avenue, EC1R 4UL. 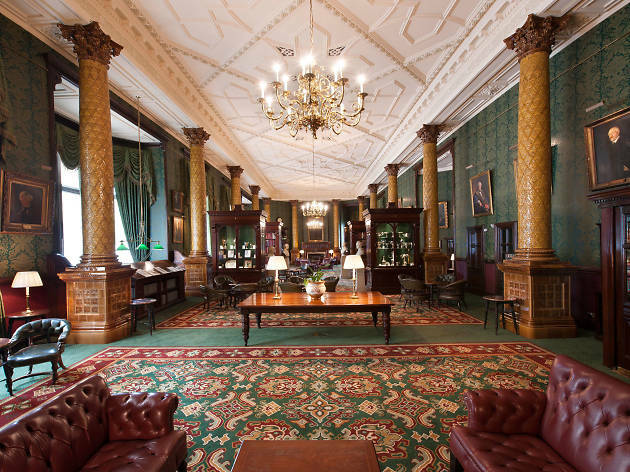 This grand livery hall from the seventeenth century has a beautiful garden, oak panelling and stained-glass windows. 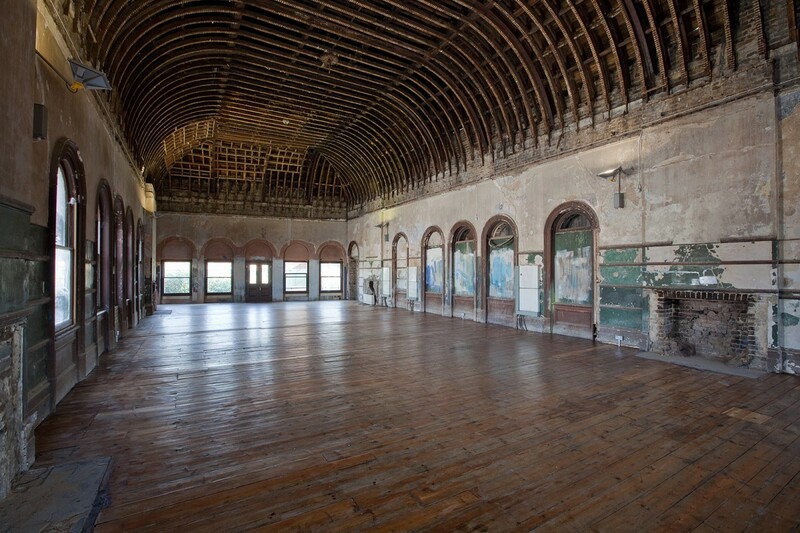 Although it was damaged by the Great Fire of London, the Hall survived miraculously untouched during WWII. Open House visitors will be able to look around and see selected items from the archives. Ave Maria Lane, EC4M 7DD. 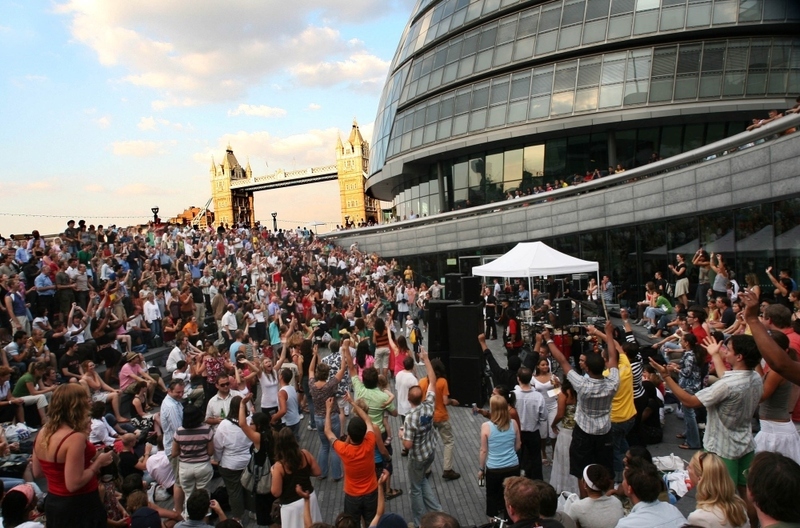 Say goodbye to summer in style – get out and get stuck into the last of the capital’s festivals, pop-ups and outdoor shindigs this month.